The Global Working Group brings together representatives of Federations in the diaspora. The GWG met in Hongkong on 15 and 16 December. As per tradition, the meeting was presided by the host Federation Chair which this year was Mr Neville Shroff of Hongkong. The meeting coincided with the AGM of the WZCC which was also graciously hosted by Hongkong. The GWG regretted the absence of any representative from the BPP though Mr Farokh Rustomji from FPZAI was indeed participating. The GWG discussions took on from the previous meeting in December 2015 at Udvada which preceded the landmark 1st Iranshah Udvada Utsav. In retrospect the GWG consensus was that the 1st IUU had been a great success and congratulations were tendered to the Organising Team led by Vada Dasturji Khurshed. The GWG looks forward to the next IUU scheduled for 23 and 24 December 2017. Mr Dinshaw Tamboly briefed the GWG about preparations and the progress in the regeneration of Udvada, with help from the dynamic Central Minister Mrs Smriti Irani. The GWG welcomed the proposal to establish a Museum in Udvada as a milestone towards regeneration. Mrs Meher Bhesania was delegated with progressing this idea, based on suggestions received from the Prime Minister himself and Mrs Irani and the help and encouragement coming from that direction. There was also a suggestion to examine if the museum could be established in Mumbai rather than in Udvada but the balance of logic was in favour of Udvada – considering the cost of land in Mumbai. The Museum Project would be developed in conjunction with Dasturji Khurshed and Mr Tamboly while calling upon the technical expertise of Dr Shernaz Cama, Mrs Pheroza Godrej and Mrs Firoza Mistree. A proposal to enable overseas Anjumans and Donors to donate in each case One Year’s supply of Kathi to Agiaries that require such assistance was also taken up. 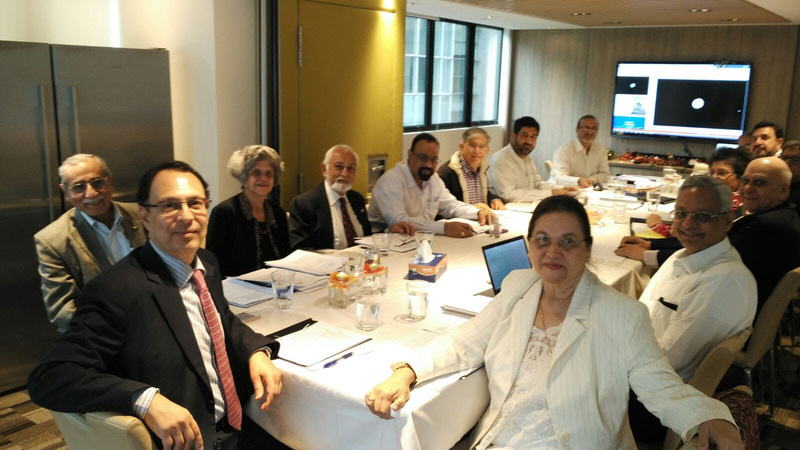 The GWG received an update on preparations for the 11th World Congress to be hosted in Perth, Australia – from Mr Firoz Pestonji and Mr Jimmy Medhora on behalf of the Organising Committee. Details will be released in due course by the Organisers. The GWG also decided that Mr Yazdi Tantra will expand the portal Zoroastrians.net to disseminate information on Demographics, Opportunities, Activities and related Developments worldwide and the Regional Federations will publicize this portal to their memberships. This should ensure a Single Window of Information. It was mooted that GWG should appoint an Administrator to oversee progress on its decisions and be a central point for communications. Initially Mr Neville Shroff of Hongkong was requested to take up this assignment subject to the agreement of the Hongkong Board. As regards Entrepreneurship, it was felt the WZCC was the right forum to progress this initiative. Subsequently several members and well wishers have continued this dialogue and will be taking forward initiatives to Change the mindset of Zoroastrian youth and more importantly their parents towards Risk Taking. The GWG reiterated the view that it was most important for leaders and in particular elected officers from the diaspora to meet and talk periodically because the contacts and frienships that are made in such interaction serve dramatically to improve relations and tackle problems. Neville Shroff and his team were profusely thanked for their hospitality and for hosting these twin events with great warmth and professionalism. Further details can be obtained by the media from Dorab Mistry, Dinshaw Tamboly, Homi Gandhi or Rohinton Rivetna. Small and Medium businesses fot the younger Parsi boys and girls must be encouraged, supported both financially and with experise and professional advise. Our youths must get out of comfort zones of jobs. They may not be the next Wadias or Godrej or Tatas, no one expects that. If larger corporate groups can make this their mission and incubate such smaller ventures, a new sense of pride will come and a whole new historic journey will begin.